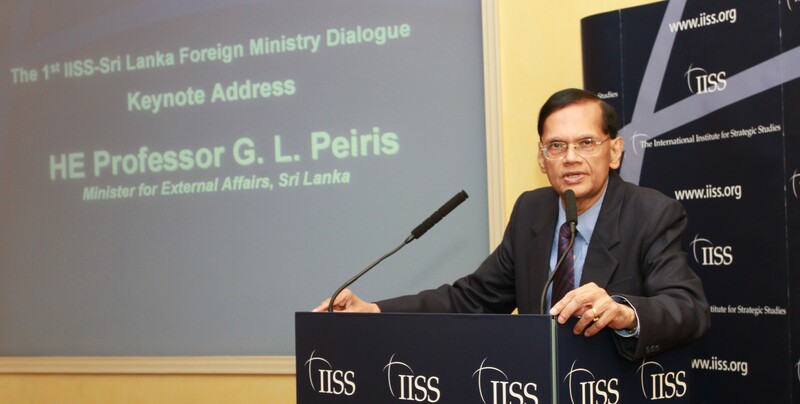 Delivering the Keynote Address of the first Dialogue between the International Institute of Strategic Studies (IISS) in London and the Ministry of External Affairs of Sri Lanka, the External Affairs Minister Professor G.L Peiris said that it is regrettable that groups close to the LTTE, knowing very well that they cannot unleash violence the way they did with impunity in the past, have now taken on an initiative of a different complexion, which has assumed the character of an economic onslaught against Sri Lanka. Their purpose now is to dissuade investors and tourists from coming to Sri Lanka and cut off access to western markets for Sri Lankan products. Referring to a query from The Telegraph yesterday seeking the views of the Government of Sri Lanka on a number of photographs the suppliers of which had claimed to be taken in the North of Sri Lanka during the final phases of the conflict which ended in last May, the Minister said that the group which is close to the LTTE and had supplied the photographs to the newspapers themselves had admitted that they were not in a position to confirm the authenticity, place and the veracity of the material supplied by them. Citing this as an example to explain the nature of the misinformation campaign against Sri Lanka, the Minister added that when several photographs allegedly depicting war crimes were first published by Channel 4, the Government clearly established, by reference to technical considerations, that they were not genuine but fake. However, the same set of photographs continues to appear in a well planned, systematically orchestrated pattern, from time to time. He recalled that one week before the European Commission was scheduled to take a decision on the extension of GSP+ trade concessions to Sri Lanka, they again surfaced. A report, strongly adverse to Sri Lanka but phrased in the vaguest language, with reference to anonymous sources, without any attribution or identification, was launched with considerable fanfare by the International Crisis Group in London. The timing of this event had great significance: it took place, Minister Peiris pointed out, a week before the European Commission was due to make a decision having important repercussions for Sri Lanka. On the very next day, for good measure, Amnesty International followed suit, also in London with a similar charade, Professor Peiris continued. Responding to a question raised by the Amnesty International representative on the Witness Protection Bill the Minister said that the draft bill is under consideration by Parliament but it will be decided by the Parliament according to the needs of Sri Lanka and not as dictated by any other party. The Minister stated that Amnesty International was acting on a political agenda at present, their postures determined by preconceived notions and prejudices, with scant respect for objectivity of judgement. Commenting on the dedication of the government of Sri Lanka to pursue a political solution the Minister said that the solution has to be decided by the people of Sri Lanka. The Minister also said that whatever the Government would do about the future of the country in shaping its destiny has to be done in consonance with those who actually live and die in Sri Lanka. He added that President Mahinda Rajapaksa has had a series of meetings with legitimate representatives of the Tamil people, who necessarily carry for more credibility than self-appointed guardians who live thousands of miles away from Sri Lanka, pursuing their own agendas with very little sensitivity to the genuine aspirations of the Tamils living in Sri Lanka. The Minister said that the government will, with its two thirds majority which provides it with the legal capability to change the Constitution, address he relevant issues through a due process. The Keynote address also contained extensive reference to the present developments in Sri Lanka including the progress made with regard to resettlement of the displaced, major development drives aimed at restoration of infrastructure and livelihood of the people in the conflict affected areas, and the work done so far by the Lessons Learnt and Reconciliation Commission. Minister Peiris referred to the firmly established relationship, nurtured by history and culture, between Sri Lanka and the United Kingdom. He went on to identify a variety of fields which offer abundant scope for fruitful collaboration between the two countries in the new era which has opened in Sri Lanka after the eradication of terrorism. The Dialogue also featured three sessions on “Post Conflict Progress in Sri Lanka”, Sri Lanka – UK Bilateral Relations: Future Perspectives” and “Countering Terrorism & Transnational Terrorist Front Organizations”. This is scheduled to continue as an annual event between the International Institute of Strategic Studies in London and the Ministry of External Affairs of Sri Lanka.